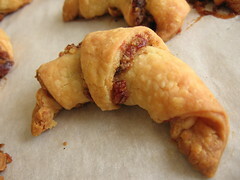 Polish Rugelach - Do You Know The Muffin Man? Notes: With the leftover rugelach dough from a double batch made a few months ago, I baked 16 of these cookies this morning. The filling had a lot of melted butter which leaked out during baking. I like the cranberry-walnut combination along with the allspice, but I would definitely cut back on the butter for next time.